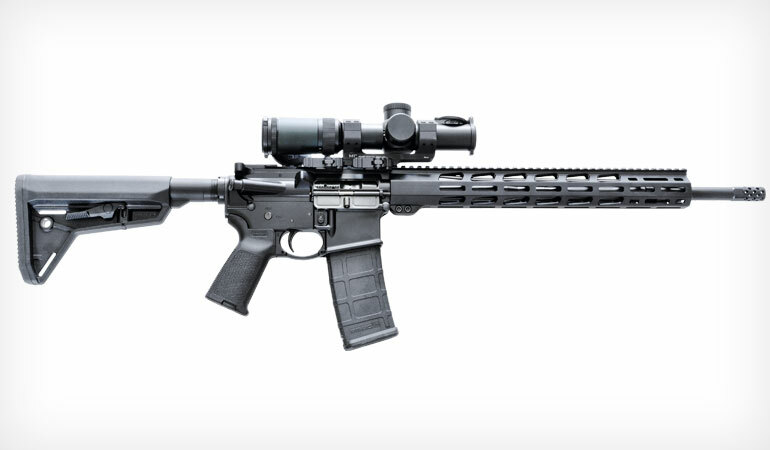 Ruger’s AR-556 MPR is one gun that can do it all. In a short time the Ruger AR-556 has become the direct-gas-impingement M4-style AR-15 rifle of choice for many people. It offers everything you need in a well-made reliable package with a few unique Ruger touches—for a low price. It took the company a few years, but Ruger has finally introduced a second version of its AR-556. It’s the MPR, which stands for Multi-Purpose Rifle. From the name it’s clear Ruger intends this rifle to be a do-it-all AR. The original AR-556 is a capable rifle in its own right, but the differences between these two rifles add up to substantially different packages. The two most easily spotted differences between the original AR-556 and the MPR are barrel length and the handguard. The AR-556 has a 16-inch barrel with a fixed front sight and a round polymer handguard, while the new MPR sports an 18-inch barrel inside a free-float aluminum handguard. The MPR’s 18-inch barrel has a 1:8 twist. The 1:8 is believed by many to be the best twist rate for an AR barrel because it will handle bullets from 35 grains to 77 grains—every bullet weight that fits into a .223/5.56 magazine. The original AR-556 featured this same twist rate, which was one of the reasons why the rifle was, and is, such a good deal. It features five-groove (5R) rifling, which is generally thought to provide increased accuracy over older rifling types. The barrel is cold-hammer-forged 4140 chrome-moly steel with a nitride finish for corrosion resistance. For the first six inches or so it has a heavy profile, then it narrows. Forward of the handguard the barrel has a 0.70-inch diameter. With the stock fully extended, the balance point on the AR-556 MPR is right under the front takedown pin, which is excellent for an 18-inch-barreled rifle. The guns are being built at Ruger’s relatively new North Carolina facility. One of the biggest improvements over the original AR-556 is the addition of the firm’s Elite 452 trigger. I am not one of those people who worships at the altar of thick barrels on fighting rifles, and since “multi-purpose” is right in the name of the MPR, it qualifies. Sure, thicker barrels take longer to get hot and hold their zero better when they get hot. However, in any defensive situation outside of Afghanistan, if you’re firing fast enough to get your barrel so hot your point of impact actually shifts, the bad guys are going to be close enough that the point of impact shift won’t be nearly enough to take you off target. A light barrel, on the other hand, is light all the time. The barrel has M4 feed ramps. While they were specifically designed to aid in reliability when shooting full-auto, they sure don’t hurt anything when chugging along in simple semiauto. This barrel also features a 5.56 NATO chamber, which means it will safely handle both commercial .223 Rem. ammo as well as the slightly hotter 5.56 NATO military loads. The bolt is machined from 9310 alloy steel, shot-peened and pressure tested. Unlike the original AR-556, which has a carbine-length gas system, the MPR’s longer barrel allows Ruger to use a rifle-length gas system. The longer gas system slows down bolt speed and, everything else being equal, makes for a softer-shooting gun. Instead of an A2-style flash hider, the barrel on the MPR is tipped with a radially ported muzzle brake of Ruger’s own design. There are ports on the bottom of this brake, so you’ll be kicking up dust if you’re shooting anywhere close to prone. It extends only 11/8 inches past the muzzle, so it really isn’t any longer than the ubiquitous A2 birdcage flash hider. The barrel has the standard AR thread pitch of 1/2x28, so it will accept any standard muzzle device. The 15-inch M-Lok handguard provides a lot of real estate for mounting accessories or placing your support hand. While loud, the 30-port brake does a great job of taming recoil. 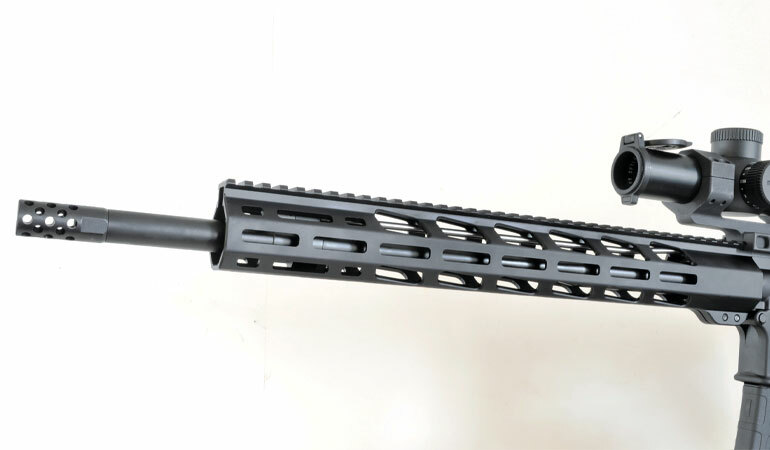 The barrel free-floats inside a 15-inch aluminum handguard with M-Lok accessory attachment slots at three, six and nine o’clock, as well as some additional angled slots near the muzzle that work great for mounting lights. This is a rather slim handguard. It’s 1.5 inches wide and two inches tall measured from the top of the rail. M-Lok is a slot-based mounting system designed by Magpul, the kings of AR accessories, so it isn’t a big surprise to see other Magpul products on this rifle. Ruger designed its own pistol grip for the original AR-556, but to better match the Magpul SL (Slim Line) stock, the company went with the Magpul SL pistol grip as well. The oversize polymer handguard is a Ruger-made product. 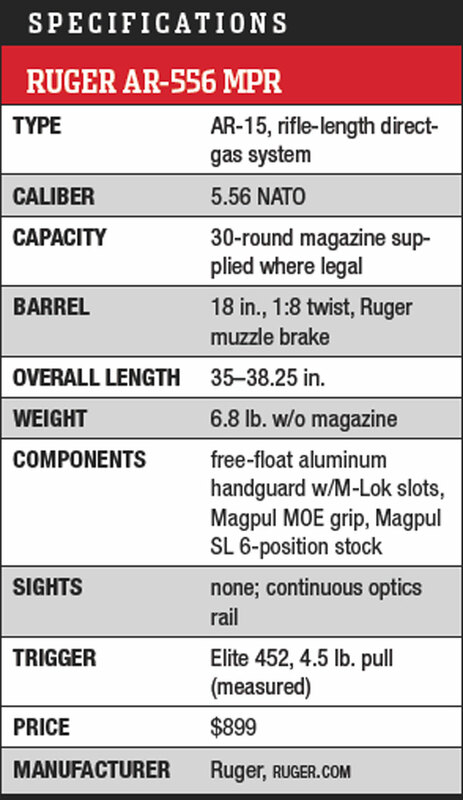 The standard MPR model ships with a 30-round magazine—except to restrictive states, where the rifle comes with a 10-rounder. My sample came with a Magpul Gen2 PMag. Both stock and grip provide good looks and functionality without adding any extra weight. 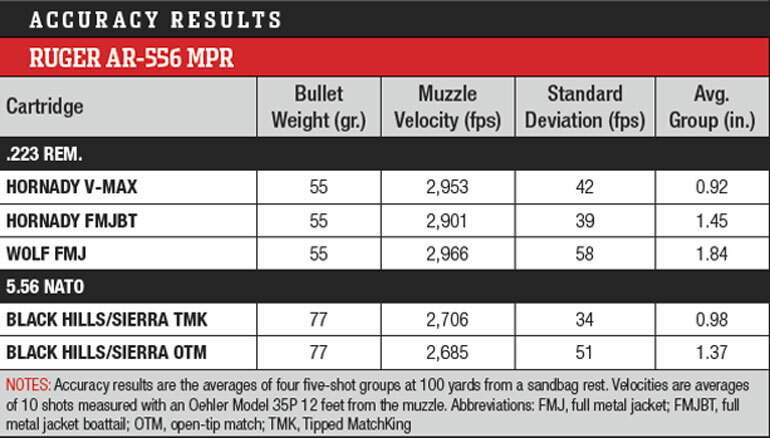 In fact, at 6.8 pounds the AR-556 MPR is only a third of a pound heavier than the original AR-556, and that weight difference is mostly the result of the MPR’s longer barrel. Of course, the original AR-556 came with front and rear sights, which add a little weight, whereas the MPR has none. 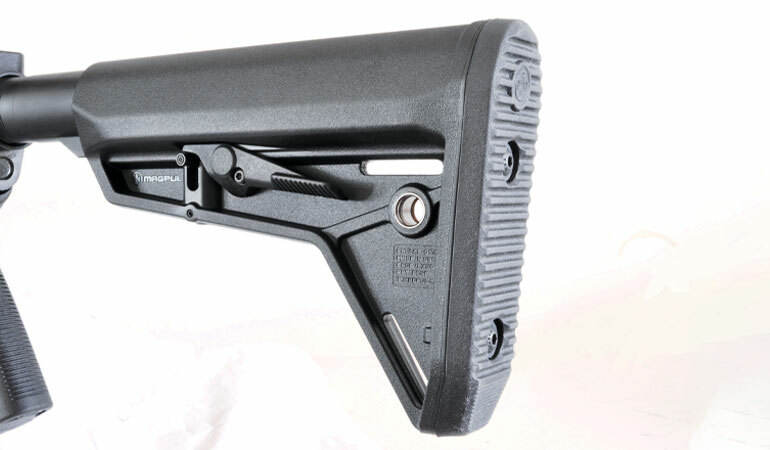 The Magpul stock sits on a mil-spec six-position receiver extension. The upper and lower receivers are 7075-T6 aluminum forgings with Type III hardcoat anodizing. Underneath the Ruger logo on the left side of the receiver, you’ll see these rifles are made in Ruger’s Mayodan, North Carolina, facility. The upper receiver features a brass deflector, forward assist and dust cover, making this is a full-featured AR. Ruger turned to Magpul for the six-position SL stock—sporting both QD pockets and traditional sling slots—and the MOE grip. As it is a “basic” M4-style AR, the original AR-556 comes with a GI-style single-stage trigger. Those usually run north of six pounds and are often gritty. 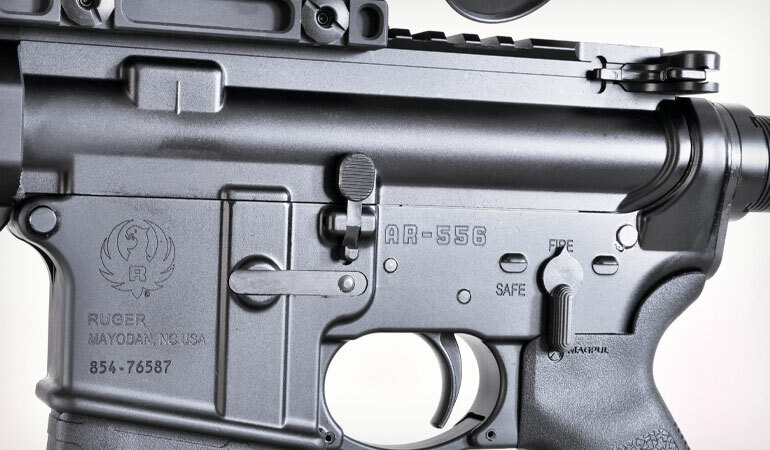 The AR-556 MPR is equipped with Ruger’s Elite 452 trigger, which the company first started offering a few years ago in the SR-556 Takedown rifle. The Elite 452 is a two-stage trigger advertised as providing a crisp 4.5-pound trigger pull with a full-power hammer spring. I’ve had a decent amount of experience with Elite 452 triggers, and they’ve all performed as advertised, which means it is a huge upgrade from the original AR trigger pull. (Ruger sells the Elite 452 trigger separately on shopruger.com for $160.) The trigger pull on my sample rifle came in exactly at the advertised 4.5-pound weight. To wring out this inexpensive “do it all” rifle, I mounted a the CMR8 from Hi-Lux in a QD scope mount from Midwest Industries. Accuracy out of the Ruger was impressive, with a few loads printing under one m.o.a. Depending on the ammo, the two extra inches of barrel the MPR sports over 16-inch “M4-style” rifles will give you roughly 50 more feet per second. ARs are just fun rifles to shoot, which is one of the main reasons for their popularity. The ammo is about as inexpensive as rifle ammo gets, and the recoil is negligible. After a separate trip for the sandbag benchrest work, I headed to the range for some fun with my two sons, the MPR and several other rifles. The MPR turned out to be the favorite of my oldest son. “This is just fun to shoot!” he told me. “It’s big and it’s loud, but it’s got absolutely no recoil.” He’s not wrong. The 30-port brake on the MPR makes it as soft-shooting as any dedicated competition rifle I’ve ever tested. Just make sure your earplugs are in all the way. AR-15 style rifles are, of course, modular, and what separates various competing rifles often isn’t much more than the combination of accessories the manufacturer has chosen. As the MPR in the name of this piece stands for multi-purpose rifle, the folks at Ruger have set it up with the parts and accessories they feel allow it to do everything well. An AR with a collapsible stock and a free-floating barrel inside a long aluminum handguard is considered the way to set up your tactical or competition rifle these days, although you really only see 18-inch barrels on competition rifles and Mk12 SPR clones. This one’s tipped with a compensator, which no self-respecting competition rifle would do without. The 1:8 twist is the perfect twist rate for everything, at least in my opinion. And while not as high-speed as many of the match models on the market, the Ruger Elite 452 is a solid trigger and provides a vastly improved pull over the standard GI-style trigger pull. Further, long modular handguards are in style because they allow you to put your support hand all the way out there if you want. This handguard gives you that length plus all sorts of real estate for mounting accessories. The bits and pieces Ruger chose to produce the MPR package with could work just as well as a “tactical” rifle—whatever that is—although most people of a tactical bent would swap out the muzzle brake for the flash hider of their choice. Currently, the base model Ruger AR-556 has a suggested retail of $799, which means the MPR is only $100 more. For that money, you get a better looking and perhaps stronger stock, a vastly better trigger pull, a more modular handguard, and overall a softer-recoiling rifle due to the rifle-length gas system and compensator. The only thing it lacks is the original AR-556’s iron sights.